The International Maritime Organization (IMO) has set new regulations for the shipping industry that take effect January 1, 2020. The new regulation will reduce the limit of sulphur emissions from 3,5% down to 0,5%. This is a drastic reduction which is estimated to save hundreds of thousands of lives each year. The pollution from container ships, cruise ships, and other large vessels is greatly attributed to the bunker fuel they use. Bunker fuel is essentially the leftovers after the more valuable fuels like gasoline and diesel are refined out of raw oil. The fuel is often solid and needs to be warmed before being burned, resulting in a raw exhaust that pollutes not only the air, but also the port areas where these ships dock. The new regulations will have a positive effect on the environment, but they also present challenges to the shipping industry. To meet the new emission standards, the ships will need to use different versions of low sulphur fuels, the kind many people use to fuel their cars and SUVs. The demand from the shipping industry will compete directly with current demand for clean burning diesel for personal and commercial vehicles. Another challenge is the refining capacity. Demand for these cleaner fuels is likely to skyrocket in 2020, but the refining industry is unlikely to have the infrastructure to deal with that demand in place so soon. Key ports in the US and Europe may have access to the cleaner fuels, but secondary ports around the globe, like those used by Specialty Coffee Industry, may not. How will this affect Specialty Coffee? The short answer is cost. The cost of clean, low sulphur fuel is almost double that of the Bunker fuel that is currently used. That price differentiation could increase even more during the first part of 2020 as demand for cleaner fuel suddenly spikes. Shipping costs will rise as that price increase is passed along to customers. The IMO is also proposing a speed reduction of ships by 10-20% in order reduce emissions. That means coffee will spend more time on the sea, and more time at port waiting for those ships to arrive to collect it. This could potentially impact the quality of the coffee, and the window of time we have to roast and sell it. If the cost of shipping increases as significantly as expected, the manufacturing industry will likely move production that has been outsourced, to China and other countries, back to the markets where the manufactured products are consumed. This is not an option for coffee. The ideal climatic conditions for growing coffee are found in countries around the equator, while its consumers are overwhelmingly in the Northern Hemisphere, with emphasis on the north! Our industry doesn’t have the option of moving production to another part of the world, so we are entirely reliant on shipping to bring our product to market. The coffee industry will be dependent on shipping no matter the price, but the pain may be temporary. The initial price increases could come down over time as supply comes closer to meeting demand. However this could take several years. So what can we do in the meantime? Plan ahead! We can offer some alternatives that can help hedge costs against the rise of shipping costs. Planning your future buying with our sales team for 2019 and 2020 can help. By buying ahead we can lock in pricing with our suppliers to offset future increases. Reefer containers are available from several of our origins, we just need some time to book them (see the paragraph above). Your sales person can help organise this. CCS also offers frozen storage in the US and the EU. Buying ahead and freezing coffee, either at one of our warehouses or locally at your own local facility, can mean that you are roasting a cheaper supply while the rest of the market is paying for more expensive shipping. That will keep you competitive. We are always working to keep our clients informed of changes in the market. Please contact our sales team to discuss your future planning, and subscribe to our newsletter for more updates. We are pleased to announce that as of 2018, we will be offering frozen green coffee storage at three warehouses across Europe and the United States: Hall Street Storage (Brooklyn, New York), Schaefer's Cold Storage (Oakland, California), and Voller's Hamburg GMBH (Hamburg, Germany). Maintaining the high quality of green coffee we import is of the utmost importance to us at the Collaborative Coffee Source, so we're constantly looking for ways to improve. Look for no more evidence than the fact that we also now offer refrigerated containers from Ethiopia. Like refrigerated containers, our frozen storage service is a cost you will have to consider into your budget. You may wonder if this is worthwhile in the end, and may be skeptical of the results. Well, I can firmly and emphatically tell you that it flat out works. I spent seven years working alongside George Howell, who tirelessly searches for ways to maintain the quality of each coffee he purchases. Back in 2004, he started freezing green in an effort to allow his business to showcase these pristine lots over the course of the entire year (and as it turns out, beyond!). He noticed immediate success, in that there was no noticeable degradation of flavor or vibrancy. Fast forward to 2012, and the scale had grown to a point where a large majority, if not all, of George's coffee was being kept in an industrial freezer twenty miles from the roastery. I mention 2012, because during that year, George decided to see what the limitations of freezing coffee were. So, we put aside two bags of a stellar Ethiopian coffee, and just waited. We obviously spot checked the coffee a couple times along the way (with astounding results), but it wasn't until three years later that we production roasted the lot. It was fantastic. As good as the day we locked it away. We showcased this coffee at the 2017 Re:co Symposium. Skeptical? Don't just take my word for it. In conjunction with us showcasing it at Re:co, Chris Hendon (author: Water for Coffee, currently Assistant Professor of Chemistry at the University of Oregon) gave a presentation on (many subjects, but also) Cryogenics of Frozen Coffee. This presentation and accompanying slides are now available online as of yesterday. He does a brilliant job explaining the chemistry of how and why you should freeze coffee. Not sold? Well, then, let's go for a name you all know and love: David Stallings, (formerly of Collaborative Coffee Source) also agrees that freezing green coffee is the best way to maintain its quality. David told me "I still have some coffees in my freezer from three years ago that taste great." David, like George, stores some green coffee on-site in chest freezers, much like those you use to store bulk meat and vegetables. Plus, he uses some industrial commercial freezer warehouses. It works on large and small scales, but a word of caution, make sure that the seals on the freezer are snug, and don't open and close the freezer too often. A stable environment is crucial to maintaining tip top quality. Other than that, I urge you to try it for yourself! The science backs it up, and it works. I couldn't be more thrilled that we are offering this service, having seen and tasted the proof with my own taste-buds. We’re moving warehouses! Amazing coffees for clearance prices. See the Clearance Price List, and contact Nico for samples. 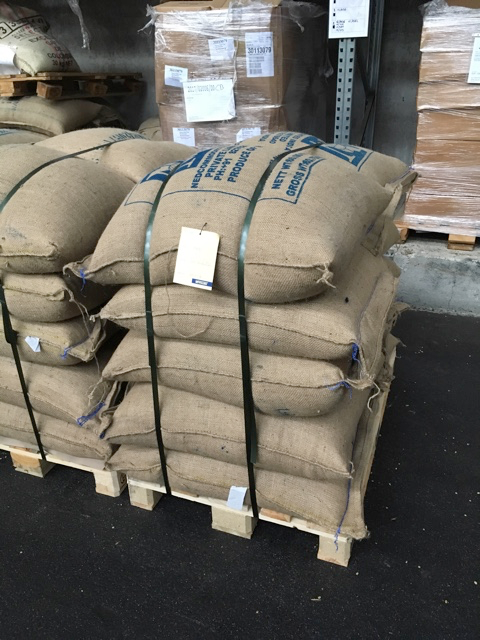 Our priority is to deliver your coffee as quickly as possible and in its best possible condition, and we know there have been some problems in this area for customers receiving coffees from our warehousing and shipping provider in Antwerp. We take your feedback very seriously, which is why we are switching our main European warehouse to Vollers in Hamburg, a warehousing company focused on specialty coffee. Hamburg is a substantial sized port, located 86km inland from the ocean on the Elbe River, with a very long history with coffee. The first coffee house in Hamburg opened in 1677, and the warehouses lining the Speicherstadt archipelago in the HafenCity quarter, built between 1883 and 1927, form the longest continuously running warehouse complex in the world. The area was awarded status as a Unesco World Heritage Site in 2015. 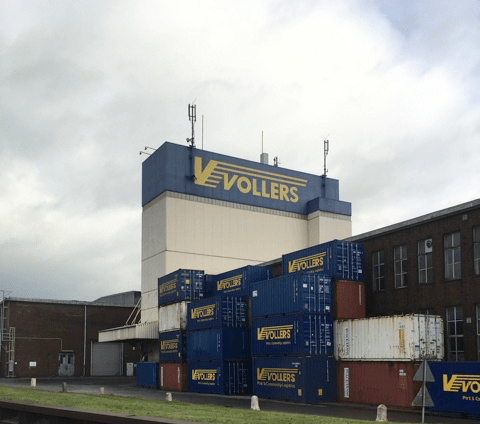 Vollers' founder, Berthold Vollers, began warehousing coffee in 1932 when he set himself up as a self-employed port inspector and warehouse clerk in Bremen. His first client was his former employer, Roselius & Co (Coffee-HAG). Last week I spent the better part of an afternoon with Marco Franz, the Department Manager for Commodities, and Finn Börnsen, Group Development Manager, at Vollers. They took considerable time out of their day to show me their facilities and discuss the ways they can better store and ship your coffee in Europe. We had a long discussion about the issues we hope to solve with storage and shipping, plus our plans for the future. Vollers regards the specialty side of coffee as the most interesting and fastest growing part of the business. Their attitude was refreshing: if we have a request or an idea for a new service, they will try and find a solution. Marco took me on a tour of the facility; their system is impressive. Vollers have a machine that wraps their pallets in plastic, and another one that straps the pallets. For normal people, that might not seem so exciting, but for a logistics guy like me it means standardized quality when the pallets are wrapped and strapped -- more stable and better security. They have an IT system that is cross-checked with a physical label on each lot. When bags are taken from the lot, name of the person, number of bags and work order number are written on the label. By the 3rd quarter of 2018 they plan to launch a system that will allow customers to log in and check their current stock, as well as track shipments sent with Vollers' own trucks. They are also working on developing a machine that will allow them transform a 60kg bag into 1-2kg vacuum blocks. This will be a great option for selling smaller volumes which could be sent by courier for quick delivery. Additionally, Vollers can freeze coffee using services of a third party, and may in the future offer freezing within their facility. As Matt wrote, shipping times are getting slower and slower, so refrigerated transport combined with frozen storage may be the key to keeping coffees fresh and vibrant. Vollers offers transport via their own food-certified trucks that service the UK and Germany. Additionally, they have a network of warehouses throughout Europe, linked by daily transport including Bremen, Rotterdam, Amsterdam, Antwerp, Bury St. Edmunds, Genoa, Trieste, Riga, Tallinn, Moscow, and by the end of next year they will add Gothenburg. This means we could potentially ship your coffee for collection at a warehouse near you. Unloading of container after arrival to port will take 1-3 days. This means coffee will be available for release maximum 3 days after arrival to port. We can organize transport to our European customers via a fleet food-certified trucks. For our customers already be buying coffee stored with Vollers, we can reduce costs of mixing pallets and transportation. Reduced transport cost for our German, Polish, and Nordic customers and potentially for our customers in larger cities. Reduced transport time to German, Polish, and Nordic customers. We are really excited by the move to Vollers and the significant improvements it will bring for storing and shipping your coffees. The first shipment to Vollers will be early 2018. If there are any questions about our move to Vollers in Hamburg and how it might benefit you, please get in touch. Moving to Hamburg means clearing out our Antwerp warehouse, which means we have some exceptional coffees for clearance prices! Check out the Clearance Price List, and contact Nico for samples. Our visit to Ethiopia a few weeks back was only my second time at origin. I expected to be inundated with information pertaining to all aspects of coffee production. After all, everything you are experiencing at that time and place is the precursor to the longevity and quality of the coffee, more so than during any other time in a coffee’s life cycle. If things are out of sorts at origin, the coffee is unlikely to express what it is capable of. It’s heavy stuff. On top of this, I had just started a new position in Buying, QC & Sample Management at the Collaborative Coffee Source. That makes me the link between the producer’s hard work and the coffee community yearning for long lasting quality beans. My focus on this trip was to understand what is being done and what could be done better next time around. Altering fermentation times? Thinner layers on the drying bed? More selective picking? All seemed to be common suggestions that are given to producers and are absolutely key to improving quality and longevity! But perhaps the most interesting thing I learned during the trip was an innovation I’d never heard of: refrigerated containers. 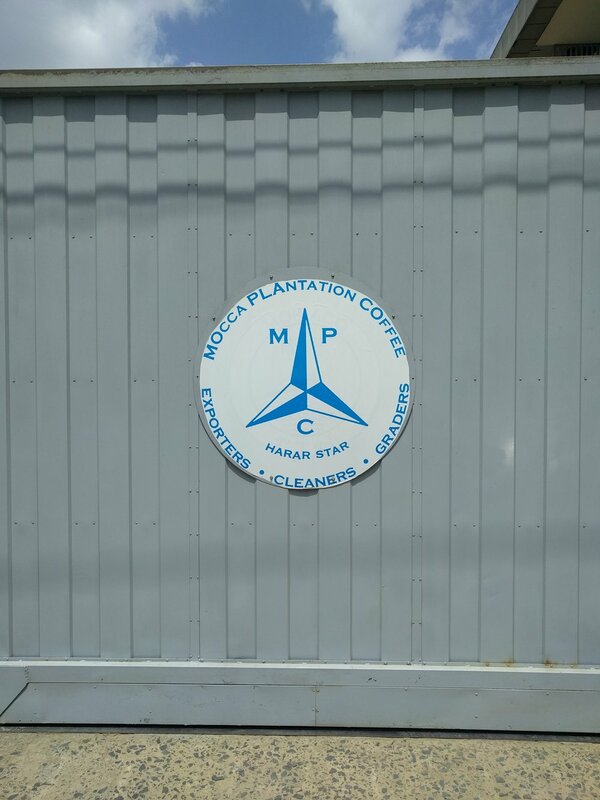 Heleanna Georgalis of Moplaco Trading has been using these "reefer containers" for one customer for a few years now, and her customer speaks very highly of the results. Coming from George Howell Coffee, famous for pioneering the freezing of green coffee, I’m well aware of the positive and lasting effects that climate control provides. As you can imagine, I was excited and astonished to learn that refrigerated containers exist. Reefer Containers - How Do They Work? Coffee harvested and processed in Ethiopia will make its way to the Port of Djibouti, located about 400km away on the shores of the Red Sea. There the coffees are transferred into a reefer container and stored at 18°C (64°F) and 60% humidity for the remainder of its (often) month-long journey across the ocean. Nitrogen, oxygen, carbon dioxide levels are also regularly checked to ensure proper storage. For the time being, only 40 foot containers are available to be refrigerated (the standard size is 20 foot). Why is this? Well, since 2000, the number of companies moving reefer container ships has dropped by 60%, so availability is very low. Companies who purchase reefer ships need twenty years to recover the initial cost, versus two years for a normal container ship. But, there is hope. One company, Seatrade Reefer Containers, continues to purchase and use reefer containers in their fleet. Due to the slower delivery times of container ships over the last few years, shipments (from all goods industries) are getting to their destination well after their intended arrival dates. Late shipments have translated into more food spoilage. Seatrade hopes these delays in container delivery will cause an increased need for reefer containers, and a resulting increase in their availability. But for now, they are still a cost to consider carefully. Find a way to fill a 40 foot container. This either means purchasing large volumes, or sharing containers with other buyers. Move a container below maximum capacity. Of course, this is a more expensive option as the cost is spread out over a smaller volume. Costs fluctuate, but the breakdown at the time of writing is this: if a normal 20 foot container costs around $900 to move from Ethiopia to your nearest port, the cost is 2.1 cents per pound. A max capacity 40 foot reefer container, over the same distance, would cost around $2,900, or 3.4 cents per pound. A 40 foot reefer container, filled to half capacity, then would then cost 6.8 cents per pound. Does refrigerated shipping provide enough value to justify this additional expense? Could you make the money back by having your 88-point Ethiopian coffee hold up for two extra months? Being cost conscious is entirely necessary for a business to be sustainable so your budget may not lend itself to this kind of transit. However, for around ten dollars more per 60 kilo bag, it may be a wise investment not having to discard bad roasts of tired coffee. To arrange reefer containers for your coffee we'll need some advanced notice. As mentioned, containers are currently limited in quantity and require a bit extra planning. However we think it's worth the extra effort. For now we are offering reefer containers from Ethiopia and we hope to add more origins in the near future. Please contact me if you have questions! I am excited by the potential of this shipping innovation and keen to discuss how reefer containers might work for you.